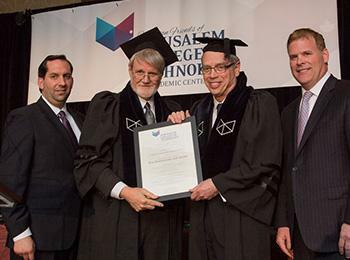 An Israeli school that integrates ultra-Orthodox Jews into the workforce held its primary fundraising event of the year last week in an evening that saw Finance Minister Joe Oliver receive an honorary degree. JCT, sometimes known by its original name, Machon Lev, has about 5,000 students in six programs. While its offerings run from business to nursing, the school’s high-tech tracks have garnered special acclaim. In recent years, the Orthodox school’s programs for haredim, or the ultra-Orthodox, have drawn attention for reducing their social and economic marginalization. More than 400 guests attended the event, where in addition to Oliver’s honour, three Toronto women received Awards of Merit: philanthropists Toby Feldberg and Honey Sherman, and Judith Shamian, president of the International Council of Nurses. David Anisman, a longtime supporter of the group, was also honoured, in time for his 100th birthday next month. The female-dominated award slate reflected the evening’s fundraising goal: a campus for one of JCT’s women’s programs, Machon Tal (Tal Campus). Currently renting facilities in Givat Shaul, it will move to permanent quarters in Bayit VeGan, near the school’s main campus in neighbouring Givat Mordechai, all in Jerusalem. The event raised almost $1 million for the 4.5-acre campus, which is a “five-year project,” said Friends CEO Simmy Zieleniec. Advancement of women is a key goal for the technology-focused institution. “When STEM [science, technology, engineering and mathematics] education for women was not yet in vogue, JCT pioneered engineering and management programs for women that have advanced a generation of women into leadership positions in many sectors of the Israeli economy,” JCT president Chaim Sukenik told the audience. Last year, the school launched TVUNA, which grants degrees in computer science to Yiddish-speaking haredi women. And two weeks ago, 30 women received their MBAs from the school’s Lustig Institute, which serves the haredi community. At times, the evening resembled a reunion of the Conservative party. Laureen Harper, wife of Prime Minister Stephen Harper, was scheduled to speak, but cancelled at the last minute. Defence Minister Jason Kenney, who had previously received an honorary degree from JCT, toasted Oliver, as did John Baird, who recently stepped down as foreign minister. Baird, who received his own honorary degree in 2012, introduced Oliver, but he also reminisced about being given the opportunity “to change” Canadian policy in the Middle East. He departed the podium as a montage of pro-Israel and pro-Jewish photos flashed on the screen, accompanied by Bruce Springsteen’s song Glory Days. Oliver, who is Jewish, acknowledged Baird’s pro-Israel bona fides by recalling a conversation with Baird on a flight home from China. “John was facing me, with a large pile of newspapers on his tray… As he scrolled through the papers, he pointed to a picture of himself standing beside a distinguished rabbi, an Israeli politician, a group of yeshiva students,” Oliver recounted. Ribbing aside, Oliver burnished his own pro-Israel credentials, linking the Jewish state’s battles with its neighbours to Canada’s struggles with militant Islam. Domestically, he pointed to Bill C-51 and to his request that the House of Commons finance committee study terrorist financing as examples of the government’s commitment to fighting terrorism. He also echoed the response of Jewish groups to Liberal Leader Justin Trudeau, who last week referenced Canada’s “none is too many” policy on Jewish immigration during the 1930s and ’40s while criticizing the government’s attitudes toward Muslims.